This political season, two signs stand out among the hundreds of roadside placards seeking votes. One says: “No CMP Corridor.” It features an image of the state of Maine with a power cord and plug inside. Another says: “Stand Up For Maine.” It has a Maine map with transmission lines and mountains. In political campaigns, outside interests commonly masquerade as grass-roots organizations in an effort to gain local support. Campaign finance rules also have made it hard to know where the money’s coming from. That trend now is reaching Maine energy politics in the fight over the New England Clean Energy Connect proposal, even though there’s no mention of the project on the November ballot. 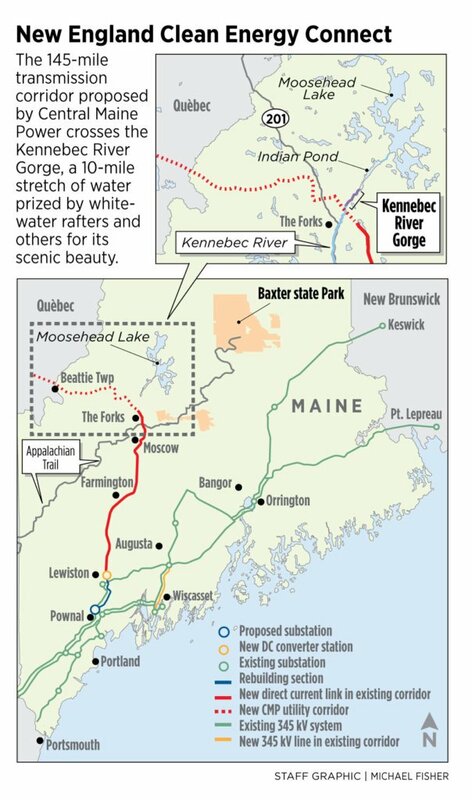 Opposition is growing to the plan for Central Maine Power and its parent company, Avangrid, to build a $1 billion corridor through 145 miles of Maine forestland to connect hydro resources in Canada with Massachusetts. But dark money and opaque alliances are making it difficult to determine who some of the opponents really are. No names are associated with what’s described as “a coalition of concerned citizens and organizations.” After multiple inquiries from the Portland Press Herald, a spokesman for the group released a statement Wednesday, but declined to answer questions about who’s in charge of the effort and funding it. Stand Up For Maine sounds like the rallying cry of a local citizens group. 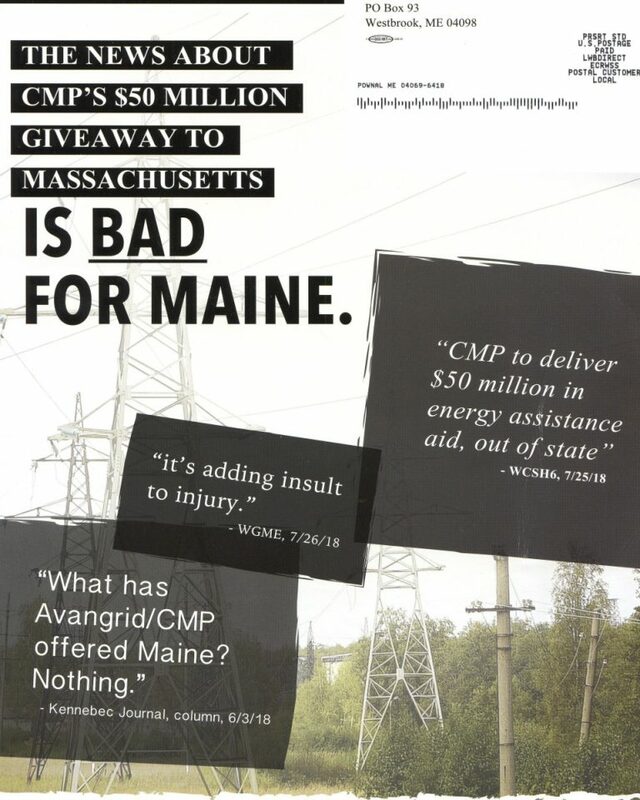 But the website says it’s an “initiative” by the New England Power Generators Association, a Boston-based trade group with members that include power plant owners with assets in Maine, such as Calpine Corp., Vistra Energy and NextEra Energy. What’s disguised to look like grass roots is really astroturf in the view of John Carroll, a spokesman for Avangrid/CMP. Power generators recognize there’s not much public empathy for fossil-fuel power plants and their free-market concerns, he said. Generators can gain more support by creating a down-home facade and talking about local control, Carroll said, but it’s deceptive. The New England power generators say they oppose “subsidized energy infrastructure,” in this case, hydropower owned by Quebec. Their holdings include natural gas-fired power plants that stand to lose millions of dollars in revenue if the transmission line is built. But Dan Dolan, president of the generators organization, said he’s not trying to conceal anything. That’s why the group’s name is clearly stated in the “About” section of the Stand Up For Maine Facebook page. “It’s not our intention to hide the ball in any of that,” he said. Dolan’s group created Stand Up for Maine in July, he said, to have an entity focused solely on fighting the Maine power line. It hired a Maine law firm and helped live-stream a public information meeting in Farmington. It plans to stay active in upcoming meetings and hearings, Dolan said. The fight over the transmission line differs from a political campaign because residents can’t vote on it. Nothing will be decided on any ballot. Decisions on whether to approve or deny the project rest with utility and environmental regulators in Maine and Massachusetts, as well as federal agencies. But opponents can amplify their voices in an effort to influence those decisions, if they can get more people to show up at public hearings and file comments with the agencies. Stop the Corridor is asking people to sign a petition opposing the project. On Sept. 11, it had gained 284 signatures toward a goal of 1,000. Even allies don’t know who’s behind it. Sandi Howard is a Maine native and rafting guide who lives in New Hampshire but spends summers in Maine at a family camp in Caratunk. 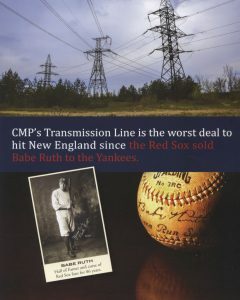 She administers a Facebook page called: “Say NO to 145-mile CMP transmission line through Maine.” It has more than 3,200 members. Howard organized a rally in early September, held before a meeting about the project at the state Department of Environmental Protection. Her effort is all-volunteer and crowd-funded; she’s asking members to pay $6 for each protest sign they take. In organizing the rally, Howard said she reached out to Stop the Corridor through its Facebook page, the only way she could communicate with the coalition. Howard said that before being contacted by the Press Herald, she was unfamiliar with Stand Up For Maine and its proxy role. Asked if she was comfortable supporting the agendas of power-plant owners and anonymous organizers, Howard said she recognizes that not all project opponents are aligned on every issue. 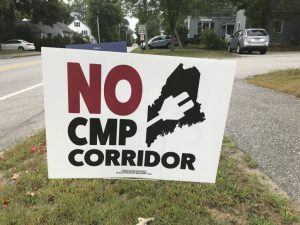 Rep. Janice Cooper, D-Yarmouth, said she didn’t give any thought to who was behind the “No CMP Corridor” signs when she put one along a well-traveled street in her town. She picked up signs with a couple of different designs at the DEP rally, where she spoke against the project. She stuck another sign in front of her house. It’s the version being used by Sandi Howard’s group and features a “No” symbol with a slash through a Maine map. Yarmouth isn’t affected by the New England Clean Energy Connect project. But Cooper said she wanted people in her district to know about it and the upcoming public hearings. Cooper is campaigning for re-election and has served on the legislative committee that handles energy matters. Asked if she has concerns about fossil-fuel power plant owners pretending to be citizens in the path of a power line, Cooper noted that these issues bring together “strange bedfellows.” But she said Stop the Corridor should make its connections public. Carroll, at Avangrid/CMP, said opponents are content to enter into an “unholy alliance” because it reinforces their message. But he said people who care about the impact of climate change on trout streams, for instance, might question their partnership with owners of the oil- and gas-fired power plants that are emitting greenhouse gases. “I don’t think the New England power generators care about trout,” he said.